John Mackie appeared at Dunfermline Sheriff Court. A drug addict tried to break into the home of a 69-year-old woman as she slept. The terrified woman heard banging at her front door at 4am and phoned 999. John Mackie (42) spent the night trying to break into cars on the streets of Kirkcaldy. He was tracked down because he took his ex-partner’s dog with him and had left a trail of blood on the cars. Mackie, a prisoner at Perth, appeared at Dunfermline Sheriff Court, where he admitted a string of offences on his crime spree. On February 6 or 7 at Lomond Gardens, he attempted to open doors of two cars with intent to steal. He also committed two similar offences in Pentland Place. He then entered an insecure car in Benarty Street and stole a quantity of coins. On February 7, he attempted to force open the doors of a house with intent to steal. At 4.20am Valerie Anderson was in her bed when she woke up to the loud sound of banging. She called police who found the black dog in the garden and inquiries revealed it was owned by Mackie’s former partner. When they went to her home they found Mackie lying in bed covered in blood. 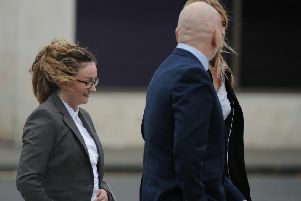 Defence solicitor Christine Hagan said her client had relapsed into substance abuse and had “very little recollection” of the offences. Sheriff Charles MacNair jailed Mackie for 18 months backdated to February 8, when he was taken into custody.